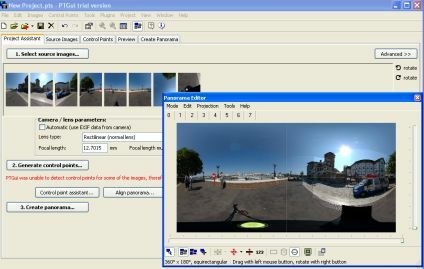 RealViz has released an update to its once impressive panorama stitching software in the form of Stitcher 5. The majority of the panoramas in this blog were stitched in its previous version 3.5 and as such version 5 has been hotly awaited. It has a number of new features, including an automatic stitch mode and the ability to add control points for those difficult alignments. At $580 Stitcher has always been a ‘high end’ option and so we took the new version for a test drive with a series of simple test images. 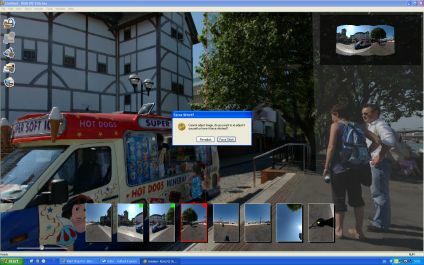 The images we used were captured outside the London Globe Theatre using a Nikon D70 and a 10.5mm lens. Due to various patent issues RealViz is not able to stitch such wide angle images directly so they we ‘defished’ beforehand using Nikon Capture 4.1. Once loaded into Stitcher the first thing one notices is its new interface, allowing a simple point and click auto stitch. However, with the 10.5mm desfished images there is noticeable distortion so the RealViz distortion option was run to enable it to line up the images. This is where Stitcher fell at the first hurdle. Using images that stitched happily in version 4 or 3.5, the new version failed to stitch the panorama. The auto stitch option featured even worse performance, failing to recognise overlaps in the images and resulting in an unusable panorama. The images were captured using a precision panoramic rig, so the fact that Stitcher failed with such shots is disappointing to say the least, especially at the $580 ex vat price tag. To ensure a fair test, we then ran the same images through PTgui 5.1 which also featues a recently revamped stitching engine at a mere 59 Euros. PTgui ran the autostitch first time, resulting in a new perfect panorama merged and saved in 5 minutes. They were no noticeable errors and the interface is clear and easy to use. Behind the scenes PTgui also features a number of advanced options on blending and control points, which can be offputting to the casual user but with such a precise autostitch engine they will probably never need to use them. Stitcher 5 has been a massive disappointment where as PTgui equals in its surprise in terms of speed and accuracy. We cant even go back to our old version of Stitcher as to install the version 5 demo all previous versions need to be unintstalled first. RealViz have a lot of ground to make up, PTgui is streets ahead and a tenth of the price. The verdict is ultimately disappointing. Nikon Capture does a very bad job of defishing images for Stitcher! Try the PTAdjust plugin for Photoshop, with the HFOV set to 90 degrees to get properly defished images before running Stitcher. I would tend to disagree, they worked fine in previous versions, even being able to batch stitch in a template. Batch stitching is an option that seems to of been removed in version 5? I’m quite happy with the semi-autostitch feature (I still like a _little_ hands on control) in Stitcher 5.0. Images were defished using Nikon Capture and Stitched using a Mac laptop, so using PTgui isn’t an option. If you won’t even try PTAdjust, you’re comparison is bogus. We have used PTA Adjust but found from use that Nikon Capture was fine for previous versions of Stitcher. As the review says most of the panoramas on this blog we created using Stitcher 3.5 using Nikon Capture with great results. We are big fans of Stitcher but version 5 does not seem to cut it. With a manual stitch it produced a ‘stitch engine error’ and shut down. Not what you want from $580 software, losing 20 minutes of work. I feel good that it’s not just me who had these issues. Oh and I have tried DxO Optics Pro to do the defishing as well and the results were even worse than with Nikon Capture as far as stitching goes. I also tried PTAdjust for another set of Nikon 10.5mm images (not mine, found it on another pano stitching application site as their demo pictures) and the results were the same, except even more ghosting. Note that those pictures weren’t shot by me so I can’t vouch for the accuracy of the nodal point. But the very same pictures stitched flawlessly in PTGui using smartblend. Go figure…..
Reassuring to find I’m not alone in my feelings for and experiences of Stitcher 5. I use a Canon 20D with 15mm lens and have a convoluted workflow producing HDR’d images with no lens correction. PTGUI stitches these distorted HDR images without a qualm. Great results. Stitcher fails to accurately stitch even corrected images despite my attempts with two lens distortion programs: BreezeBrowser Pro and DxO Optic Pro. I would think that Stitcher who will come out with a new version stitching program in 3 months capable of working on Fish eye images will do a good job. Even if some images won’t give on stitcher 5.1, you should know that fisheye images aren’t as precise as normal 30mm images. I tend to keep giving big hopes in stitcher because they work on all our problems and have a good after sales groupe. Umm, say. Did you bother to try the “High Distortion” tool?